Glimpse works by dividing your spreadsheet data into columns, identifying the column type (text, number, or date), and then displaying the data in the spreadsheet by encoding some or all of the columns with visual encodings. Columns have a variable type, which can either be discrete (typically text or date columns) or continuous (typically numeric columns). 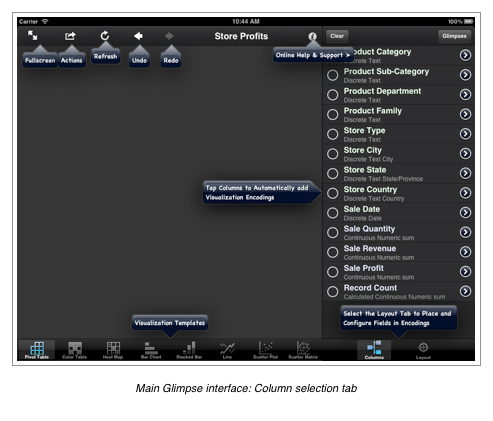 The variable type of the column dictates how it can be encoded: discrete columns are grouped together (e.g., all the products in a certain “Product Department” column will be grouped together), and continuous columns are aggregated using some aggregation function, such as the average, sum, minimum, or maximum. 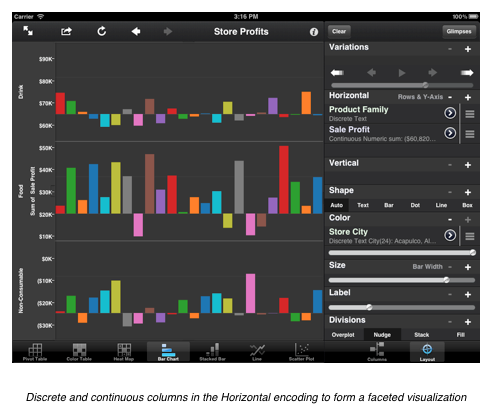 Glimpse is designed to allow the explorative and iterative development of data visualizations. You will not be constrained by choices you have made previously in your visualization. You can perform unlimited undo and redo operations using the back and forward buttons, and you can add, remove, and rearrange columns in encodings at any time. Glimpse animates the changes you make to encodings, so you are able to watch the results of the changes you make. 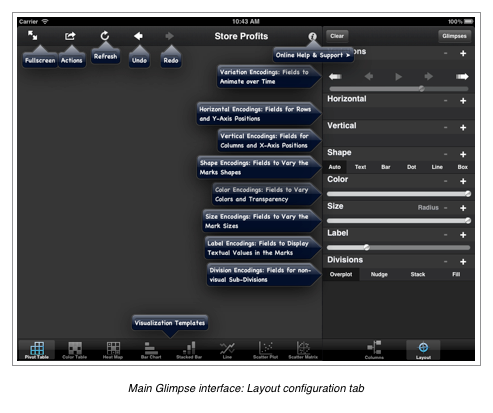 The main Glimpse user interface is a traditional master-detail split view, with the visualization canvas, actions toolbar, and visualization template tabs on the left side, and the column layout controls on the right side. The column layout controls have two tabs: “Columns”, which you use to select your initial columns to automatically assign to visual encodings, and “Layout”, which provides you with more fine-grained control over how the columns will be represented on the canvas. When the Columns tab is selected, you can quickly select columns to add to the visualization by tapping the checkbox area to the left of the field name. Selecting columns in this way will automatically assign the column to an encoding and activate the recommended visualization templates based on the columns selected. Once selected, tapping the column again will remove all encodings for that column from the visualization. The Columns tab is a good way to quickly select the spreadsheet columns you are interested in visualizing before moving on the finer-grained encoding customization in the Layout tab. 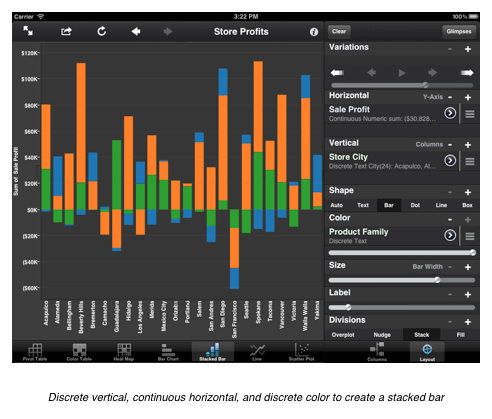 While Glimpse does not limit your visualizations to pre-defined chart types, it also acknowledges that many users will want to display their data in a traditional format such as a bar chart or scatter plot. In order to easily lay out data in this way, we automatically identify the appropriate types of charts that might be used to visualize the selected columns and display them beneath the canvas as visualization template tabs. When you select a template tab, the column encodings will automatically be arranged in such a way as to show your data in a way that conforms to the template. Note that everything that can by done using the visualization template tabs can also be accomplished by manually arranging and configuring fields in the Layout tab. To this end, the visualization tabs can be considered “shortcuts” for performing sequences of layout operations. Bear in mind that as with all other operations in Glimpse, you can use the back button to undo the application of visualization templates. A common use of visualization tabs is to quickly experiment with which visualization types might be appropriate for deriving insights from your data. Once you have selected your working set of columns, you can switch to the Layout tab to define exactly how the columns are represented by visual encodings. The Layout tab consists of eight encoding types: Horizontal & Vertical, Shape, Color, Size, Label, Divisions, and Variations. Each of these will be discussed in this section. These encodings define how the values in the columns are transformed into visual attributes on the visualization canvas. Some encodings (such as Variations) accept only discrete column variable types, and others (such as Size) restrict you to adding only a single column but do not constrain the variable type of the column. Other encodings (such as Horizontal and Vertical) allow multiple columns to be added, which can be either discrete or continuous. While the Columns tab is the quickest way to add multiple columns to the Layout tab, you can also add a column to a specific encoding within the Layout tab by tapping the plus ( ) button to the right of the encoding’s name. Similarly, you can remove encodings by tapping the minus ( ) button. You can also drag columns into different encodings by tapping and holding on the three-bar icon ( ) to the right of the column itself, and then sliding the column up or down into the new encoding position. Changes made to encodings will be immediately updated on the visualization canvas by performing an animated transition from the previous state to the new state. And as with all other operation in Glimpse, you can always revert back to the previous state using the back button to undo the last operation. 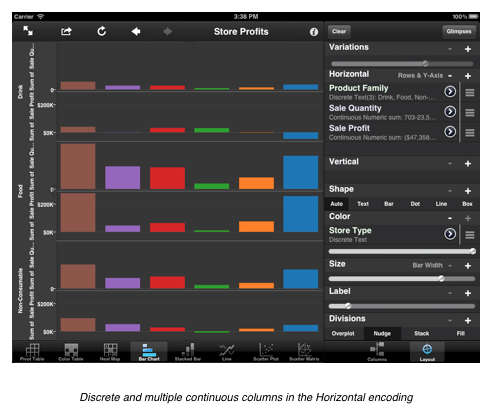 ☞ Note: While it is theoretically possible to add any number of columns to encodings, practical limitations of the iPad restrict the total number of permutations of column values that are possible to visualize. If you surpass this number, Glimpse will issue a warning and will automatically revert back to the previous state. The Horizontal encoding section defines how column values are represented on the horizontal plane. It can accept both discrete and continuous fields. 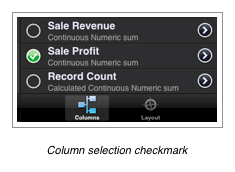 ☞ Note: It is not currently possible to customize the sort order of column values. When a discrete field is added to the Horizontal encoding, it will create rows in the visualization, with a single row matching a single distinct value for the column. 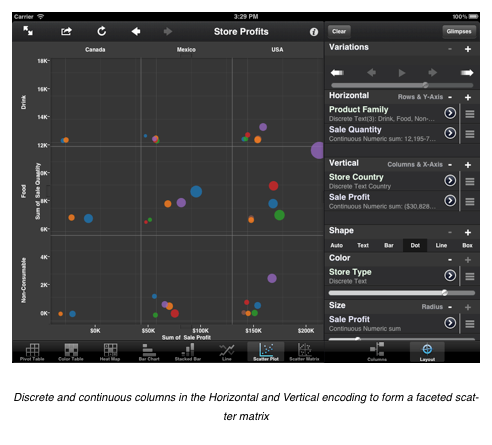 In this way, you can create a horizontal tabular visualization. When a continuous column is added to the Horizontal encoding, the position of the visualization’s Shape encoding will by placed at the specified position along an axis whose values are determined by range of values in the column’s aggregate. The exact meaning of the placement depending on the shape being used. For example, the Dot shape will be centered on the value of the continuous field’s aggregated values, and the Bar shape will have its height set to the value. The Horizontal encoding can also hold both discrete and continuous columns, provided that the discrete column comes before the continuous column. (The user-interface enforces this requirement, so you can’t accidentally place them in the wrong order.) When a discrete column is followed by a continuous column, the resulting visualization will be faceted, in that each distinct discrete value will hold a continuous axis. Faceted visualizations are also sometimes referred to as lattices, trellis plots, or small multiples, and can be useful to compare similar visualizations side-by-side. You can also add multiple continuous columns to the Horizontal encoding, which will sub-divide each distinct value in the discrete column into an axis for each continuous field. The Vertical encoding behaves exactly like the Horizontal encoding, except that its values are laid out along the vertical plane. Discrete fields are represented as columns, and continuous columns are represented as axes. Combining Vertical encodings with Horizontal encodings is a very flexible mechanism for visualizing data in creative ways. 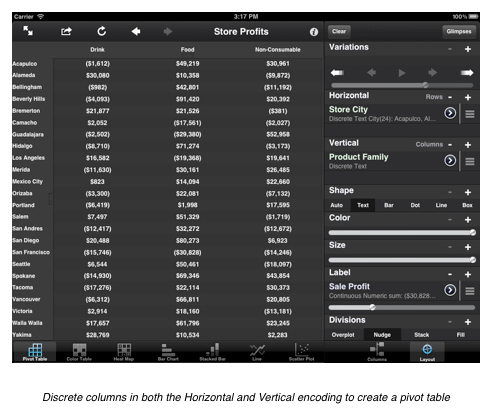 For example, having a discrete column in the Horizontal encoding and another discrete column in the Vertical encoding, with a continuous field in the Label encoding, creates a tabulated summary of the data (often referred to as a pivot table or crosstab). Placing a continuous field in the Horizontal encoding and a discrete field in the Vertical encoding allows you to create a bar chart or, when setting another discrete field in the Color encoding, a stacked bar chart. 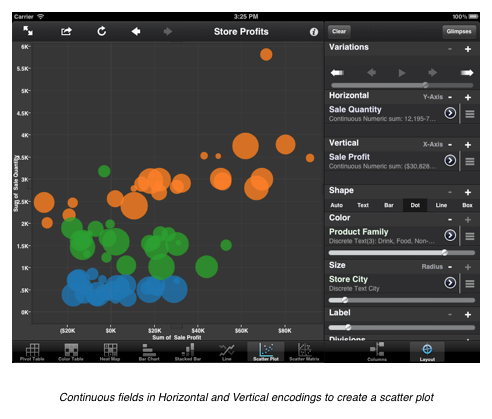 If you have continuous fields in both the Horizontal and Vertical encodings with columns in the Color encoding, you can create a scatter plot (also sometimes called a dot plot or bubble chart). Furthermore, you can add a discrete and a continuous column to both the Horizontal and Vertical encodings, and you will have a scatter matrix, where each distinct value combination of the horizontal and vertical discrete columns creates a panel that will contain a scatter plot along the two continuous axes. These sorts of visualizations are often referred to as scatter matrixes, trellis plots, or lattice plots. The Shape encoding defines The shape of the graphical mark that is drawn to represent a given data point. 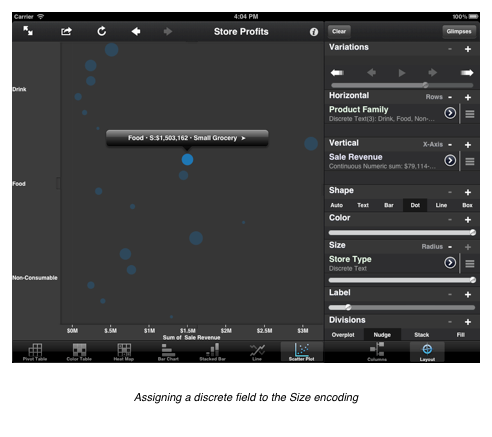 1.Auto: Glimpse automatically picks a shape that will best represent your selected columns. 2.Text: The column in the Label encoding will be drawn as simple text with no other shape. 3.Bar: The bar shape will be drawn from the baseline (which is always zero in this version of Glimpse) to the value of the continuous field that is being represented. 4.Dot: A circle will be drawn at the position of the corresponding continuous field. 5.Line: Similar to the dot shape, but multiple dots of the same color will be connected by a line. 6.Box: Similar to the dot, except a square shape will be drawn. In addition to selecting from a static list of charts, you can also add a discrete field to the Shape encoding, and Glimpse will automatically assign a specific shape to each distinct value of the column, up to a maximum of seven distinct values, after which the shapes will be recycled. 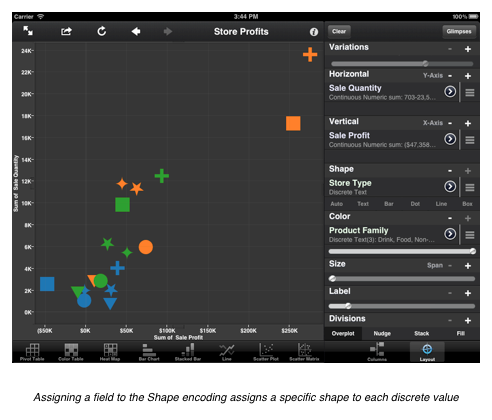 ☞ Note: The palette of shapes that are assigned to fields added to the Shape encoding cannot currently be customized. 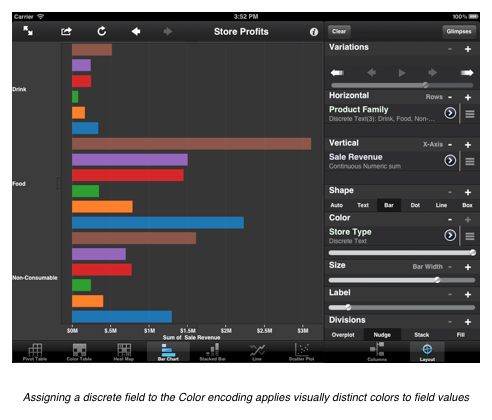 The Color encoding section is used to assign colors to the shapes that are displayed on the visualization canvas. 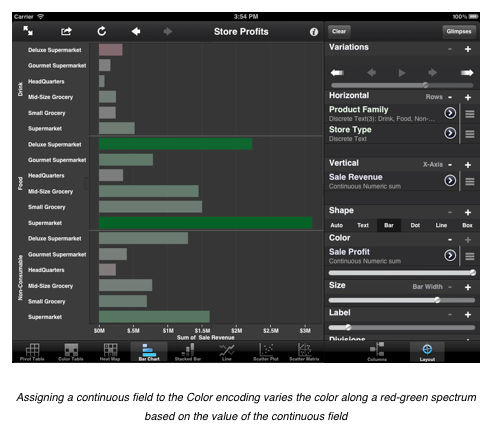 It can accept either discrete fields (in which case the colors will be chosen from a palette of visually distinct selections), or continuous fields (in which case the color will lie on a gradient from light green to dark green, or from red to green if the values of the columns include both negative and positive numbers). The Color encoding section also contains a slider, which allows you to control the transparency of the shape. This can be useful when some shapes are covered by others, which is common in continuous-continuous panels like scatter plots. ☞ Note: It is not currently possible to customize the colors that are assigned to discrete or continuous fields that are added to the Color palette. The Size encoding lets you specify the size of the shape. When assigned to a discrete column, an arbitrary size will be assigned to each distinct value of the column. When a continuous field is assigned to the Size encoding, the size will vary from according to the value of the field, where the lower values are the smallest size, and the higher values are the largest size. The meaning of the Size encoding is different for different shapes. For dots and boxes, the size is the radius of the shape. For bars (whose length is contingent on the continuous field), the size is the width of the bar. You can also control the magnitude of the shape size using the slider in the Size encoding. The magnitude is applied evenly to any column assigned to the Size encoding, so the relative sizes will always remain constant. ☞ Note: It is not currently possible to customize the sizes that are assigned to individual values in discrete columns. The Label encoding lets you attach a textual label to a shape. You can specify either a discrete or continuous column to the label, and both are treated exactly the same way: the label’s value is displayed inside the shape. You can additionally control the size of labels with the Label slider, which allows you to uniformly adjust the magnitude of the font size. The Variations encoding allows you to create a playable animation where the data visualized on the canvas is subdivided based on each distinct value in the discrete column added to the encoding. It can be thought of as a temporal third dimension on top of the two horizontal and vertical geometric dimensions. Playing variations is a powerful and compelling way to show how values change across different column values. Since the variations are displayed as a temporal sequence of values, it is most often used to display date columns, but any discrete column can be added to the Variations encoding. Furthermore, the Variations encoding accepts multiple discrete columns, in which case the variations will play along all existent permutations of the combined values of the discrete columns. The Variations encoding contains a control that is similar to other media playback controls on the iPad. The center play/pause button allows you to start and stop the variation animation cycle. The left and right buttons allow you to manually move to the previous or next variations, and the outermost arrows allow you to speed up or slow down the animation speeds. The slider below the animation control buttons lets you slide to a specific variation value. 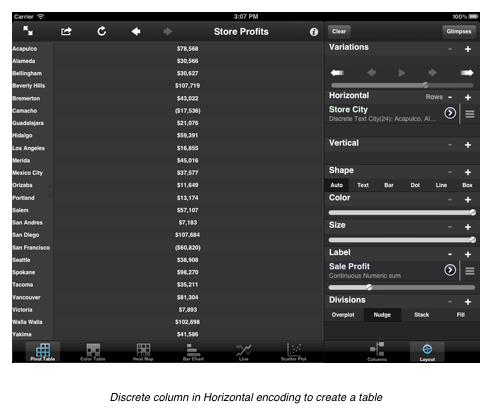 ☞ Note: It is not currently possible to control the order of discrete column values that are cycled in the variations. The Divisions encoding is unique in that it is a non-visual encoding. This means that any fields added to the the Divisions encoding won’t have any direct visual representation. However, discrete fields in the Divisions encoding will result in additional data points being added to the canvas. It is often used to add more dots to a scatter plot without having to assign them to specific visual attribute. 1.Overplot: Do not perform any positional adjustment; shapes can be rendered on top of each other, possibly hiding the existence of other marks unless transparency is used. 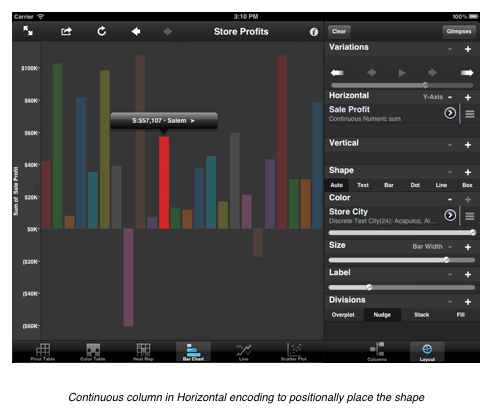 2.Nudge: Each shape is assigned a sub-divided area in the panel, so that shapes are displayed side-by-side. 3.Stack: Shapes are additively stacked on top of each other. 4.Fill: Shapes are stacked on top of each other in such a way that they always take up 100% of the available space. As mentioned earlier, all layout operations in Glimpse can be undone using the back button on the toolbar. This should encourage experimentation and exploration of data, since you can always return to the previous state by undoing recent operations. The round refresh button next to the undo button allows you to reload a visualization. Also, while a visualization is being calculated and rendered, the arrow will spin; tapping the arrow while it is spinning will attempt to cancel the current operation, which is useful when the amount of data being rendered is taking a long time to calculate.